We know while in Belize, you will search for seaside adventures along the Caribbean Sea, but Belize also offers an equally enticing parallel experience of lush and densely populated rainforest that pays tribute to Belize’s ancient Mayan history. Here at Coco Plum we want to make sure you have a chance to experience the best of both worlds. Our Honeymoon/Lover’s Getaway package and All Inclusive package include options to explore the Belize mainland. Two of our most popular excursions include: the Xunantunich Mayan Ruin tour and the Zipline & Cave Tubing tour. 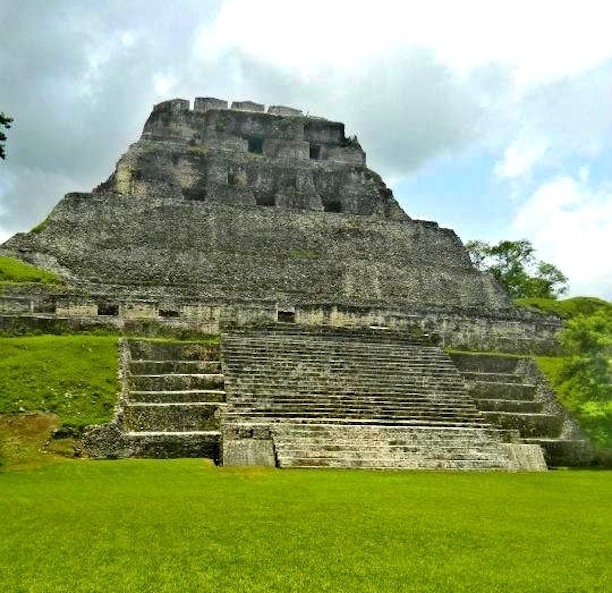 Xunantunich is an ancient Mayan ruin site located in the westernmost part of Belize in the Cayo district. In fact, from the top of the “El Castillo” temple, one can even see the Guatemalan border in the distance. Xunantunich originates from the Yucatec language and translates to “stone maiden.” Legend has it that many years ago a villager discovered the ruin and saw a beautiful maiden clothed in traditional Mayan wear standing near the side entrance of the temple; however, as the villager built up the courage to approach her, she disappeared into the temple and he never saw her again. Today, many refer to the stone maiden as a spirit who lives inside the “El Castillo” temple. If you are lucky, who knows – you might meet her during your trip to Xunantunich! At one point in time, Belize was at the center of the Mayan civilization in Central America. During the peak of the Mayan civilization (around 1000 AD) as many as 400,000 Mayans are thought to have inhabited the area. Although the population has diminished today, there are presently three groups of Mayans living in various areas of Belize who offer unique food, language, and history that help makeup the Belizean culture. Although there are many Mayan dialects, the three most commonly spoken Mayan languages are Yucateco (spoken in the North), Kekchi, and Mopanero (spoken in the South and West). Most Mayans speak English and Belizean Creole. Additionally, because of the close proximity and shared history with Guatemala, Mexico, and Honduras, many also speak Spanish. As I’m sure you’re figuring out this is quite a diverse and remarkable culture! Today, Mayans make up about 11 percent of Belize’s population and most live in either local towns and cities or have a community of self-governed land run under an alcalde system. Agriculture is at the center of Mayan life and their most common food group is corn. From corn, we get to enjoy wonderful foods like tortillas and tamales. Other than magnificent Mayan ruins and temples, Mayans also discovered Belize’s immense cave systems for ceremonial purposes to reach the underworld. Here at Coco Plum, we offer a separate excursion that includes zip lining through the tree tops of the Belize rainforest and exploring ancient limestone caves while tubing down the river. While zip lining we encourage you to take in all the natural wildlife surrounding you. As you soar through the rainforest, be on the lookout for exotic plants and birds! After a short hike through the jungle, you will reach the opening of the cave. Get ready to hop in the crystal blue water with your tube and begin your guided journey through the cave system. Take this chance to move your headlight over the shimmering stalactites, stalagmites, and rim stone dams. Keep an eye out for ancient Mayan artifacts or carvings while floating down the river in the cave! For those of you who have done either of these excursions, we would love to hear your feedback and advice for future guests planning to take the trip. Both excursions require moderate to strenuous activity levels and will take about 2 hours to arrive at the destination. Check out Coco Plum’s tour schedule here.